Until April 3, 2017, Lhouette’s Post Urban Glamour exhibition is at 45 Park Lane, so we caught up to quiz him on art and London life. Here’s what the man leading the way in a new wave of young British artists had to say. Where are the best places to see art in London? Personally I love the grit of East London. There are lots of great street art and pop up shops, I also love the markets, finding little kitsch curiosities and outsider art. The big galleries are good too, I often visit the Saatchi Gallery and exhibitions at Tate Modern ‒the Sigmar Polke exhibition was one of my favourites in recent years. Tough question, I think probably Tate Modern in terms of the building and physical space. For seeing a diverse mix of innovative urban art, I tend to go straight to Lazarides in London’s Fitzrovia. Where else in the capital inspires you? I stayed with my brother for a while in Brick Lane, Shoreditch, when I first left the Royal Navy back in 2007. I adored the area’s rawness and creative energy and it definitely spurred me on to start creating art again. That said, I love the opulence of Mayfair, it has a vibrant energy too but in a completely different way. I guess it’s experiencing the contrast of both the fine and the grime that appeals to me. Acrylic and aerosol because they are both pretty fast drying mediums, which enables me to work on an individual piece without waiting days to add more layers, they also work well with lots of other mediums and non-conventional canvases. Section of ‘Bulletproof’ – original acrylic and aerosol stencil work. Are there any art books you would recommend reading? I’ve just started reading Grayson Perry’s The Descent of Man, it’s more of a social commentary on today’s perception of masculinity but I like reading works and articles about artists and their viewpoints, instead of dusty old volumes about the renaissance period. What are your views on integrating art into public spaces? I think if it’s done well then great, but it’s such a broad and complex subject. Personally, I think we should be exposed to as much art as possible but one man’s art is another man’s rubbish, plus public commissions for underprivileged areas can be a real minefield in terms of executing something that reflects the community. What couldn’t you live without that only London offers? In my eyes, London is the artistic hub of the world. I’m not sure there is anywhere else in the country that comes close, so when I need to top up the inspiration tank I head to London. If you could be locked in a famous London building for the night, which one would it be? I’ve always liked the idea of having the Tate Modern to myself…maybe with a Segway. Lhouette’s Post Urban Glamour exhibition at 45 Park Lane is on until April 3, 2017. 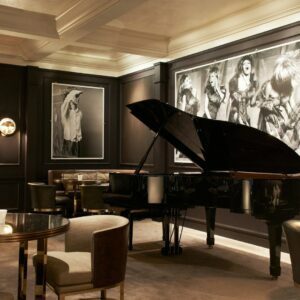 Stop by for drinks at BAR 45 or dine at CUT at 45 Park Lane and see the exhibition for yourself. For more insight into Lhouette’s art and inspiration, watch his interview with BBC London News here.